Mr. Morgan was a decorated World War II veteran. 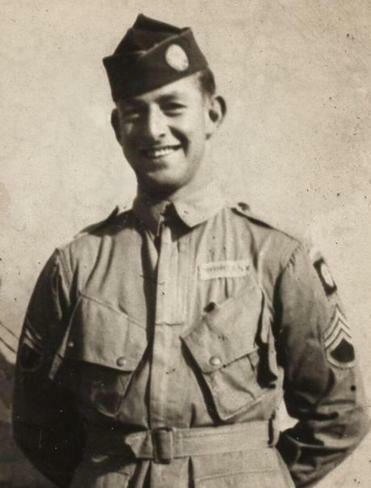 Fred B. Morgan Jr. didn’t talk about World War II for 50 years, and when he did, no story was quite as harrowing as his memory of treating a badly wounded soldier along a road in Normandy, France, while a Nazi tank approached. For his own war injuries, he received a Purple Heart and was awarded a Bronze Star as well. Mr. Morgan, known as Ted, who became an Edgartown selectman for more than 30 years, was 97 when he died April 7 in Martha’s Vineyard Hospital. As with his World War II service, Mr. Morgan’s devotion to the island community where he grew up sprang from a sense of duty, a chance to help others. Fittingly for a decorated veteran, one of the many duties Mr. Morgan took on was organizing and leading Edgartown’s Fourth of July parade, which he did for 43 years. Even his decision to step down from that role in 2012, at age 90, was duty-bound. “My memory is failing me, and that’s not a good thing when you’re trying to organize things,” he said at a Board of Selectmen meeting several days before that year’s parade, the Martha’s Vineyard Times reported. And as for the countless hours he put into the task? “I’ve enjoyed doing it,” he added. He had retired from the board a decade earlier, following a tenure that covered numerous issues, from spearheading creation of the Morgan Woods affordable-housing development to protecting beaches by instituting expensive fines for pre-dawn poachers who illegally scoop up scallops that storms wash onto the beach. “That kind of fisherman, fortunately in the minority, lives for today and says the hell with tomorrow,” he told the Globe in 1983. Mr. Morgan always kept a sharp eye on the long arc of history and the values that keep communities and families strong. His father honed his sense of what to do, and what not to do, during World War II, during which Mr. Morgan was hit with shrapnel. Some of it stayed in him the rest of his life. Their story didn’t end with simply surviving. Lieberth lived for several more decades. “I talked to him on the day he died,” Mr. Morgan told the Martha’s Vineyard Times in 2011. The oldest of three siblings, Fred Baxter Morgan Jr. was born in Edgartown in 1921, a son of Fred B. Morgan Sr., who skippered vessels, and Doris Howland Taylor. He went to stay with an uncle and aunt in Shrewsbury. Just before he enlisted, he met Florence Lambert, who is known as Floss, and whom he would later marry. Initially, he was a medical corpsman at Camp Edwards in Falmouth, where he worked 12-hour hospital shifts until he volunteered for parachute school. As a boy, he had been afraid of heights, and a friend teased him at the Edgartown drugstore when he was home on leave. “That stayed with me and I had to push myself. I couldn’t think of not doing it,” he told Lee. Mr. Morgan served as a medic in the 82nd Airborne’s 505th parachute infantry regiment, making combat jumps in Sicily, the Netherlands, Normandy, and the Battle of the Bulge during six battle campaigns. After the war ended, he married Floss in 1945, and he subsequently was called back to active duty. Mr. Morgan went on to serve in military administrative positions until the late 1960s. He retired as a lieutenant colonel and returned with his wife and children to Martha’s Vineyard, where he was an administrator at the hospital. “I led a charmed life,” he said in the oral history. The meeting room at Edgartown Town Hall is named in his honor. In addition to his wife, Floss, and his son Tim of San Antonio, Mr. Morgan leaves three other sons, Fred III of New Orleans, Dale of Oak Bluffs, and Scott of Edgartown; two daughters, Pamela and Barbara, both of Edgartown; five grandchildren; and eight great-grandchildren. A funeral service will be held at 11 a.m. Monday in the Old Whaling Church in Edgartown. For decades, Mr. Morgan kept his World War II memories to himself. “He never ever breathed a word of it,” Tim said. But when the 50th anniversary of D-Day arrived, he spoke to elementary school students about his experiences. “All of a sudden I feel it’s so important that they should know these things,” he told the Vineyard Gazette then. The lessons he shared were those he had learned during World War II, and they stayed with him always, Mr. Morgan said in a Martha’s Vineyard Magazine interview in 2015.